Holy. Moly. Can you believe that over half of 2018 is gone and summer is beginning to wind down? It’s craziness. We’ve had a tremendous amount of things going on since my last blog post so I thought I’d share a few updates on life lately, things I’m loving, and advice tidbits. Since my beginning journey of food blogging, I’ve longed for a community with opportunities to connect and learn with. For the past year, I have been working on developing Culinary Clicks - an event series bringing together online culinary creatives, offline. The vision has morphed and shifted but we finally planned and executed our first-ever pop-up event on July 26th at The Durham Hotel. It was an incredible event of networking, learning, and community building. I had the pleasure of working with a dream team of talented speakers, sponsors, and friends that helped take the event from good to great. We were so blessed to sell-out the event to an unbelievable group of passionate creatives. I’m so excited about all the professional photos we had taken by the talented Sam Holt of Samuel Holt Photography, and can’t wait to share them on Instagram and recap the entire event on our Culinary Clicks website! While I wasn’t posting new blog content over here on Cheers Years, I was producing a different type of creative artwork: an event. SOOOOO much works going into planning an event. It’s a kind of nuts. All of my fellow professional event planners out there feel me! Even if you’ve planned a dinner, shower, or even just a gal’s brunch, I’m sure you can totally relate about the amount of time it takes to plan and execute your event vision. From May all the way until the event on July 26th, I felt like my to-do list was a mile long. This event on top of my full-time career taking on new projects, keeping up with my Cheers Years social media (poorly at times, I admit), AND my personal life with husband, friends, and one big life update below made it TOUGH to get through everything. Having a support system and saying “yes” to help. My techie-stud husband helping me onsite with the first Culinary Clicks event. My husband and friends were a tremendous help to me over the past few months. When I had people pop up and ask if they could help with anything, I actually took them up on it, and I’m so glad I did. I couldn’t have gotten through the event or even day-to-day housework if I didn’t have help. The power of lists and the top 3. I’m a CRAZY list and calendar person. I have not 1, but 3 digital calendars (2 Google, 1 Outlook) and a paper planner. I use them all for the different projects in my life but I check them all every day. Even still, sometimes between all my meetings and appointments, I need to clearly see what I should get done each day to keep rolling on my goals. I typically make a list every morning of the things I’d like to accomplish. Then, I go back and ask myself “which of these things are the top 3 most important” or “what will I feel REALLY good about getting done when I call it day?”. I put a star next to those items on the list and then I number them in priority. If I only get those 3 things done, then I still accomplished a lot! A note on that, unless you really need to dig yourself out of your email inbox from a vacation or some circumstance like that, I do NOT include checking email in this top 3. Making time for meditation, gratitude, and self care. Have a cup of coffee, set a timer on my phone for 10 minutes and meditate. I would feel my body connected to the earth and my breath while thinking of the things I was grateful for followed by visualizing things I wanted to accomplish. After that, I’d try to do a quick 30-minute workout at home or driving to a studio. Shower, change, and then hop into my work tasks by 8AM. Most days, I would immediately shift from career tasks into event planning and/or blog tasks - working right through dinner and any hope of relaxing or seeing friends.I would sometimes stay up until midnight or later, then repeat the following days. However, there were days I could recognize I needed a mental break. I would allow myself to shut everything down by 6PM and go make dinner with John, have a glass of wine, see friends, or just watch Grey’s Anatomy and put a charcoal mask on my face. I’m so glad that during those moments I honored myself enough to put down the work and just focus on recharging. If I hadn’t done this, I think I would’ve easily burned out and my quality of work would have suffered. For the next event and multiple projects happening, I’ll incorporate self care even more! Mamma Mia, here we go again… I was excited to share this time last year that we moved and were planning on setting down roots. As life has its ways, we are now moving yet again. To make a long story short, we have an amazing opportunity to live in one of our favorite family homes in Raleigh. We will make the transition as soon as we can sell our home in Durham. We absolutely love Durham and are crazy about our charming historic home, but the pull to keep a house with such cherished memories and beautiful craftsmanship of our late Father is even greater. During the time of planning Culinary Clicks Pop-Up, I was working hard with John to get our house sell-ready and finalize some home repair projects. It was organized chaos. We cleaned out, renovated, and tidied the house. This definitely was (and still is) the most stressful element of life right now. We are still in the process of selling our house and haven’t yet worked out all the moving-in logistics to the new house. If I’m being honest, we’re still tired from our big move last year. The thought of moving all our belongings and starting all over with our home vision, organization, and way of life again can send me straight into a panic sometimes. HOWEVER, when I choose to meditate, think about all the positives of the situation and own the fact that this is our decision for the better in the long-run, I stay positive and focused. Still stressful, but I know that this is a labor of love, totally worth it. With all these moving pieces of life, I have to find ways to stay energized and productive beyond just coffee. I love coffee as much as all my fellow addicts out there, but if I have more than 2 cups a day I get a bit nauseated and it’s really not great for my hormones ( you can read all about on my hormone journey back in this post). That being said, keeping my levels of Iron up are a major focus for me. I’ve been doing this with the help of Spirulina. As you can see from this Instagram post, I was so inspired when I was listening to The Influencer Podcast one day and heard from the fabulous Melissa Wood of Melissa Wood Health. Towards the end of the episode she dropped the amazing recipe for her favorite energizing smoothie and now it’s totally a game-changer for me as well. I’ve taken that base recipe and adapted it a bit for whatever type of fruit is in season and greens we have in the house. You can see what I put in this smoothie bowl below in the post recap. In other variations, I’ve added peaches, chia seeds, Keifer, and my new favorite ingredient, MINT (oh. em. gee this is so good). Adding that Tablespoon of Spirulina has been critical for keeping my energy levels high without a caffeine overdose. I would highly recommend throwing it into your next favorite smoothie recipe! What is the point of all the stress of a blog, community/event series, and a career if we don’t love it and CHOOSE to see the fun in it?! 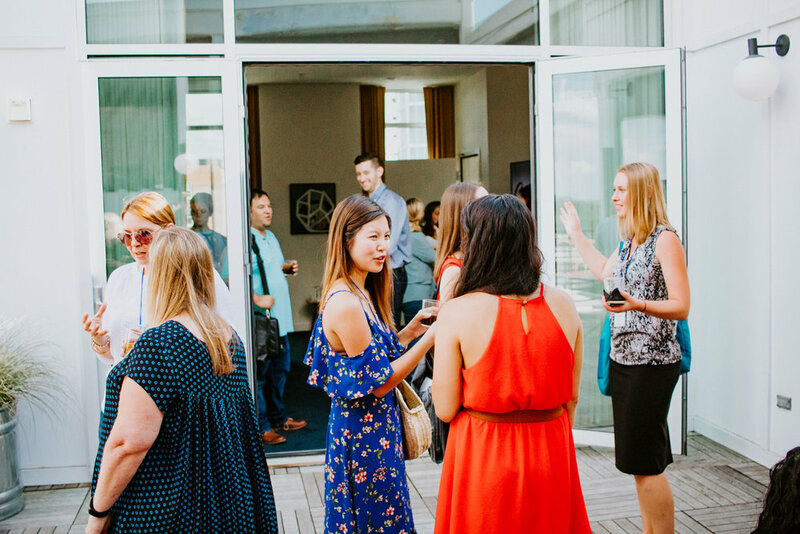 During the whirlwind of planning the event, I would literally stop whatever I was doing and do a happy dance each time we had a new attendee registration (no joke, I promise I did this!) or we landed an incredible sponsor. I would also purposefully block a day at least once every-other week to have a little no-thinking, all-playing fun. I reconnect with my guitar and played for hours, I went on a picnic, saw the sunflower field, went to the pool with my best friend, finished the Harry Potter book series (finally! ), and had fun. This time was critical to my mental and emotional health, AND it allowed me to still enjoy my summer while working towards my big goals. I’m really grateful I did this, and I’ve still got a lot more to do! It’s been insane, but it’s been a blast. What about you? How do you handle your tough challenges of a managing multiple projects while fitting in fun and self care? Comment below and let me know! Here’s to the wins, big or small, and having a little fun amongst it all… Cheers! What it’s like taking adult guitar lessons.